Redeem your gift subscription here! Got a gift code? You are just a few short steps from accessing hundreds of fun games and resources! Enter your gift code in the box below. You will be taken to the shopping basket - simply Checkout and register your details to redeem your gift for free! Want to buy a gift subscription? To buy a family subscription as a special gift click here. Watch our 3 minute video to learn more. The family subscription helps support your children’s learning by engaging them in fun and exciting activities and games. 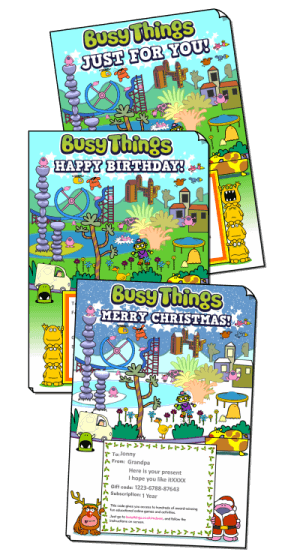 Busy Things targets core maths, literacy and phonics skills and encourages creative work with colours, shapes and sounds. To read more about our family subscription click here.